I promised that I’d create a thread when there was some work on Nautilus 3.30 to share. Here we go. The basic reason that this update is worthy of a thread is that in 3.28 Nautilus removed support for handling the desktop. In the Ubuntu team we decided that we really wanted to keep that feature, so we stayed on the last version of Nautilus before it got removed, while we figured out what to do. At the same time, Carlos Soriano (with others) was developing a GNOME Shell extension to provide desktop support. This is now getting close to being ready for use, so we decided to press ahead with updating to the current Nautilus and provide the extension. Once all of the pending builds are finished, you will be able to get all of that work from this PPA, which is available for disco only. Feel free to try it out and see what you think. You’ll note also that this version depends on tracker - this is no longer going to be optional. depending on tracker now, no need to handle it not being there. recent manager is gone now. to use the tracker based one. - ubuntu_revert_no_wallpaper.patch: have compiz do it? I know that @khurshid-alam has done some work on updating some of the Unity patches already - I’m looking forward to merging that. Both of you, please could you check that what I said is right and maybe help correct / restore patches if any need keeping? And also check my rebases didn’t break anything. I’m not sure what the state of the Compiz background support is, but hopefully it’s good because I don’t want to hold off on this more than is necessary - early testing would be a good thing here. We do still have two MIRs outstanding that mean this can’t be uploaded just yet. The code & packaging for the update is in the usual git repository, wip/ubuntu/3.30 branch. Is it really ready for prime time? I have already rebased 19_unity_open_location_xid.patch. Please take a look. Regarding wallpaper, unity-settings-daemon is already drawing the wallpaper when nautilus is not, just no desktop icons. And compiz-wallpaper plugin is in bad shape any way. For desktop icons we could use something like caja-desktop (only for drawing background and icons) keeping nautilus the default file manager. @Wimpress told us that he will accept some patches for caja and already showed us that this can be done. We also don’t need accountsservice.patch. We are already doing it in unity-settings-daemon. That leaves zeitgeist. unity-file-lens uses it. Atm, the zeitgeist-tests needs to be adapted for meson builds. But there are some issues with zeitgeist. Trying to fix those ony by one. Have you thought about how we are going to satisfy the users who don’t want desktop icons? I am aware of GNOME bug 789852 with proposed patches to actually disable default extensions. But I see there hasn’t been any progress there since January 2018. I think the search is also much faster now in nautilus 3.30 No idea about the technical background, but it could be the new tracker? But I see there hasn’t been any progress there since January 2018. Actually, the discussion was moved to GitLab, the last comment was a month ago. @didrocks seems to be waiting on more discussion from Muellner on this issue before progressing? From my POV this is a dead technology and we should be looking to remove it rather than fix it up. What about porting the Unity lens to use something else? Like tracker - probably would be a medium amount of work though. Sweet, that looks nice Guess we should try to get a new release in disco at the same time. Can’t those users just disable the extension? Presumably this is a baked-in extension like the Ubuntu Dock and Kstatusnotifieritem/appindicator support, so the toggles will make no difference and one would have to remove the Deb instead (which removes the ubuntu-desktop meta-package in the process). Well, I think there is no downside in having them if you do not use them. Whereas not having them when you want to use them (desktop+ desktop folders) is bad. Actually, and ironically, there has been a comment yesterday morning from Florian. Pausing a little bit the installer work, I plan to resume finishing addressing the concerns (the POC works from the beginning, but the patch is too large to carry it at the distro level) next week, and we’ll see. I still think that people who want to have a more vanilla GNOME environment (no desktop icons, their own or no dock, no status notifier icon) should really install the GNOME vanilla session. They are then loosing some of nice ubuntu-specific enhancements but if they don’t want to take the whole experience, this is what makes more sense than hacking and replacing pieces in an untested frankenstein environment. Respectfully, disabling desktop icons is not enough to make a Frankenstein environment. 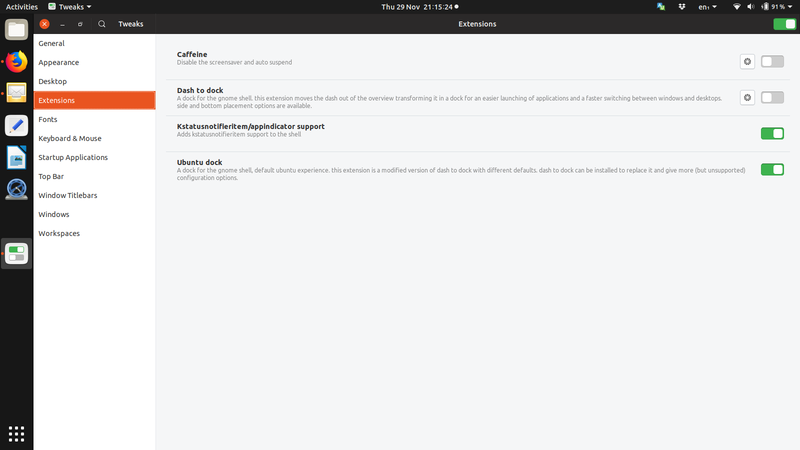 I think it is a somewhat popular way of using the desktop and has been “supported” via the GNOME Tweaks app since 2011. 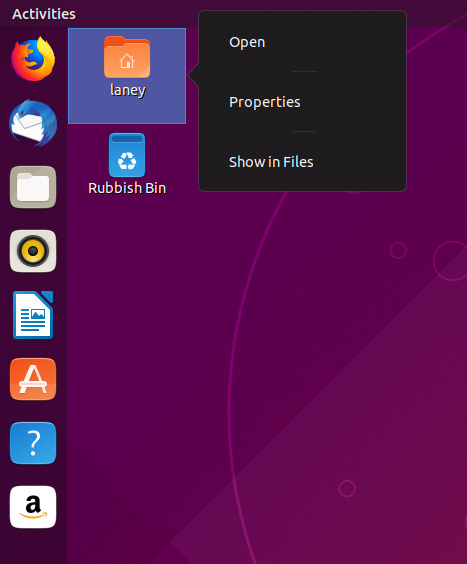 Here’s an achievable suggestion: I think it would be nice if Ubuntu 19.04 offered a more direct way of hiding the Home and Trash launchers from the desktop (and showing them again). That way, a user can easily control whether there is an empty desktop appearance or not. Sounds like a little bit like bishedding, but my point remains: it’s an unsupported configuration compared to the default experience we provide. We, for instance, add icons on the desktop in the install session and that’s only one example. So it diverges from the default. However, as said, we provide a way to get new defaults in a vanilla environment and that’s good for people who wants to personalize more, without having ubuntu-specific features relying on having extensions X, Y or Z.
I guess Tweaks can provide what you propose if it doesn’t already, but you will be the one knowing more on that front. Couldn’t this be built into gnome settings? Ofc I install gnome tweaks on most of my installations but thinking of the average Joe I would rather put features into the default applications, if “removing desktop icons” is a feature. Without a compelling case, It’s not a feature we’re currently looking to provide. You have had to use GNOME Tweaks (or a lower level tool like gsettings or dconf-editor) to disable desktop icons in Ubuntu’s default desktop for years already. So it’s not unreasonable to keep those options in the Tweaks app. In Tweaks > Extensions > Desktop icons > gear button, you can disable the Home & Trash icons. If you had any (other) desktop icons, you can delete or move those yourself. I think there’s an argument for making disabling the Home & Trash icons easier (like it was in previous GNOME releases) so someone can open a Tweaks bug for that. To give my example, I tend to disable all icons on the desktop (Home, Network Servers, and Mounted Volumes), but keep the Trash icon. So if this is going to be an option in Tweak or in GNOME settings, it would be great. So us users can pick and choose what we want. I have a simple question. What is the point of having a blank desktop ? Why should a user need to see a mostly blank screen ? This mostly blank screen will be presented to them hundreds of time while their use of Ubuntu. It’s uncluttered and upstream, some people like it that way by default for some reason and some people like to go with what upstream do. We have gnome-session, I suppose! But I think people don’t like that too much because there’s no way to graphically install it and GNOME purists would rather that were the default Ubuntu session anyway and people should, in their opinion, optionally customize from there with fully-featured GNOME Extensions (not stripped-down supported-by-default Debs). It’s basically the big battle between Ubuntu and Fedora - ‘sane defaults’ vs ‘upstream first’.